Then, Pauline told us that we cannot go from Barca without seeing the Camp Nou which is the football stadium for the FC Barcelona or the Blaugranes (for its blue-reds tones colors). We saw the rack of different trophies that it has won during the years, Pauline was boasting that FC Barca is the best team in the world (and who would have say otherwise with sucha display!). Our guide even get us to the near entrance to the actual field, to this everyone laughed cause suddenly Pauline was like totally freaking out and crying like a little girl who saw her long lost dream become a reality! This city has so many sites that are unique, one that stood out was La Pedrera which is a building that has an weird look. It has that earthquake-look as if everything was off shape and off leveled, but you can appreciate the difficulty to achieve that and keep the modern look of the building, we took several pictures of this building! 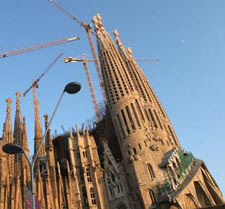 Then we follow the road to the Sagrada Familia building, which is the number one attraction here in Barcelona. And the joke in town is when this building is going to be finished, cause it is still being built! Since 1882, it was still being unfinished, as we went along the guided tour there was a miniature replica of what is the finished building with the little label that its supposed to be finished around or close to 2026! It is weird, adored by many, hated by many, the guide told us it is a polarizing building unto itself. Many of us commented about the earthy quality to the building, plus it caught on us that the ceiling hasn’t been finished and you can raise your eyes to the heavens and see the beautiful spring sky that surrounded Barcelona! As the day progressed, we went back to Pauline’s home, where her entire family was waiting and cooking the pork. Also we found our friend Martin who was watching on his cell a Real Madrid game, we can see this two eyeing each other for tomorrow. And let me tell you, that game had ups and downs and a surprised ending to be sure!